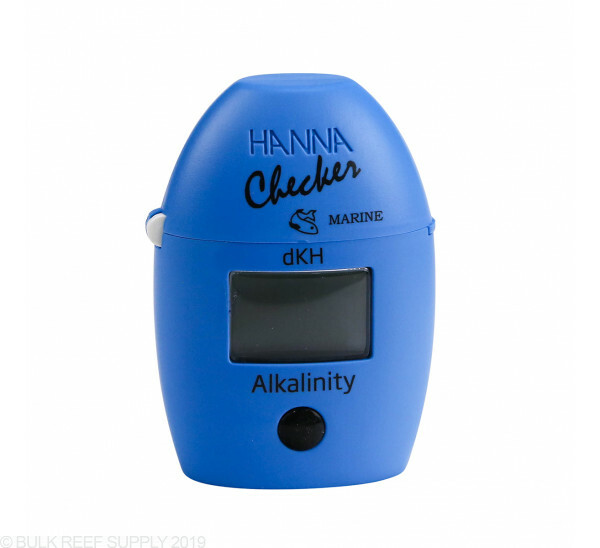 The Hanna Alkalinity checker is an awesome little tool that now will give results in DKH values that are much more common in the aquarium hobby. It will also give you accurate easy to read results with the large LCD display. We like the repeatable results and ability to purchase replacement reagents when needed. The biggest key with Hanna checkers is keeping the vials nice and clean for consistent results. Three simple steps to results. 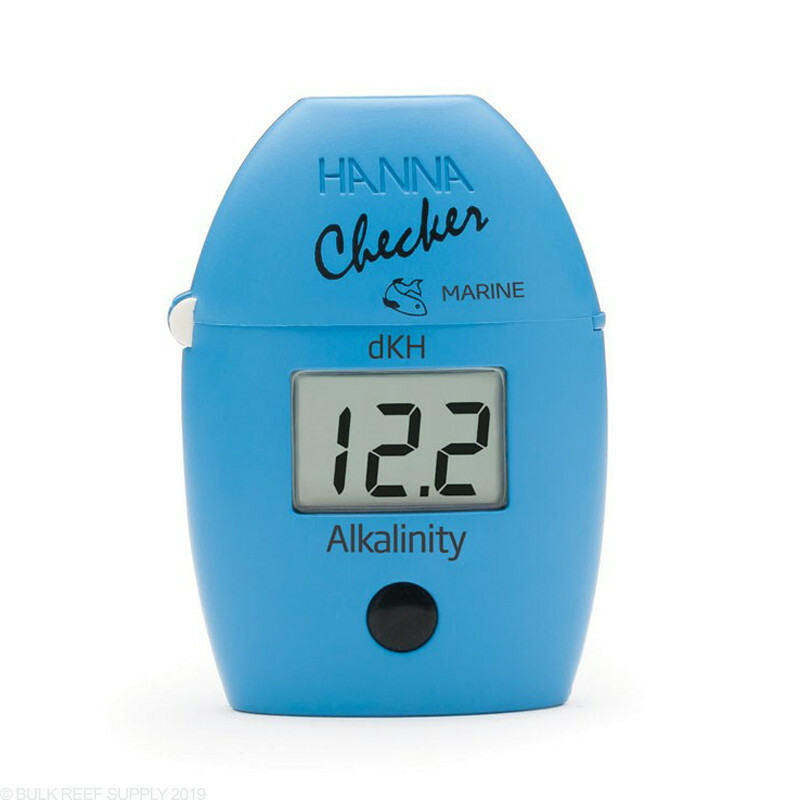 The Hanna Alkalinity Checker bridges the gap between simple chemical test kits and professional instrumentation. Accurate, affordable and easy to use. First, zero the instrument with your water sample. Next, add the reagent. 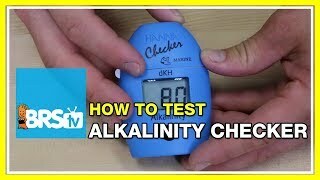 Last, place the vial into the Hanna Alkalinity Checker, press the button and read the results. Done. Chemical and titration test kits have limited accuracy and very hard to repeat that usually will rely on the human eye and lighting to determine the reading. 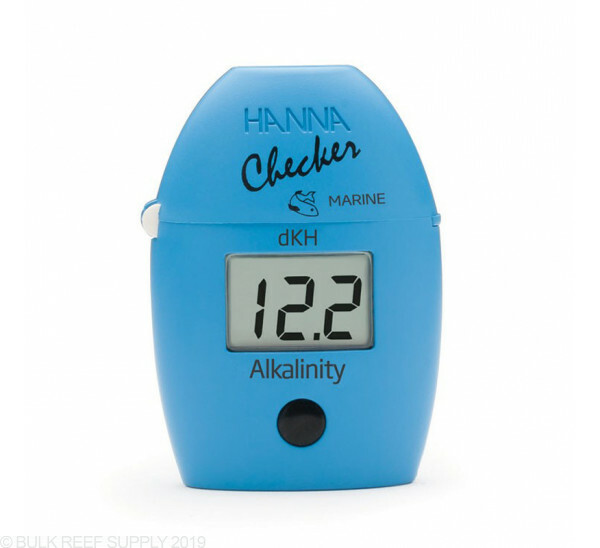 Hanna's HI772 Alkalinity Checker is much more reliable with their single light source with a fixed wavelength that will give the electronic checker the ability to make repeatable measurements time after time. Similar measurement devices are used by labs and large-scale testing facilities for their dependable and precise measurements. Designed to work with HANNA's liquid reagents. Uses 10 mL glass cuvettes. My Hanna Alkalinity checker gives me a reading of 180. I cannot imagine it's this high. I checked with my API Reef Master kit and it's reading 9dKH. I would give the nod to the Hanna Checker as the numbers are pretty close. This product makes testing easy and simple. This is Best test kit for alkalinity that is out in the market today. I love every Hanna checker I have. So easy and fast to deal with. I wish it was a little easier and cheaper to get the reagent but its not enough to not use them for sure. I am going to change all my test out with Hanna that they have available and that I can use Hanna with. I even have a Hanna PH checker as well. Love this Alk checker from Hanna, looked at them for far too long and finally made the order. I feel confident between the Hanna checker and my API test now.. The procedure is super simple, and as with any other test follow the instructions exactly for most accurate results. Super easy to use with reliable results that don’t make you guess if the color endpoint has been reached. Excellent! I have been using the Salifert alkalinity test kits with much success for many years. The only complaint I have with the Salifert test kit is the variability in the dropper bottles and knowing when the color has changed sufficiently. On many occasions, I would have to do an additional test because one of the variables I just mentioned, made me question the final result. After using the last of my Salifert test kits, I decided to give the Hanna alkalinity colorimeter a try. I find the results to be accurate and I never question the results because the Hanna process does not have dropper bottles or require identifying a color change. If you want to save time and have accurate results every time, buy this product. And the refil comes with new syringe! The good reviews on BRS are true. Bought one myself and was surprised at how easy it is to operate. Just follow the instructions and you’ll be able to get a reading within minutes. Simple and easy to use. Keep to the instructions in a timely manner for consistent results. I only had 1 odd ball result out of 12 tests, but over all showed a consistent daily use of alkalinity in my tank. I immediately clean the test syringe and vial after inputting the results with RO water, and leave the test vial full of RO water for storage and ready for the next test. Just keep it consistent. The spec says that the accuracy is +/-0.3 and +/- 5% of reading. So a reading of 10.0 could really be anywhere from 9.2 to 10.8. That's huge. Is that the spread of errors over many checkers and I could be lucky and get a good one, or is that the spread of measurement errors for any particular checker? 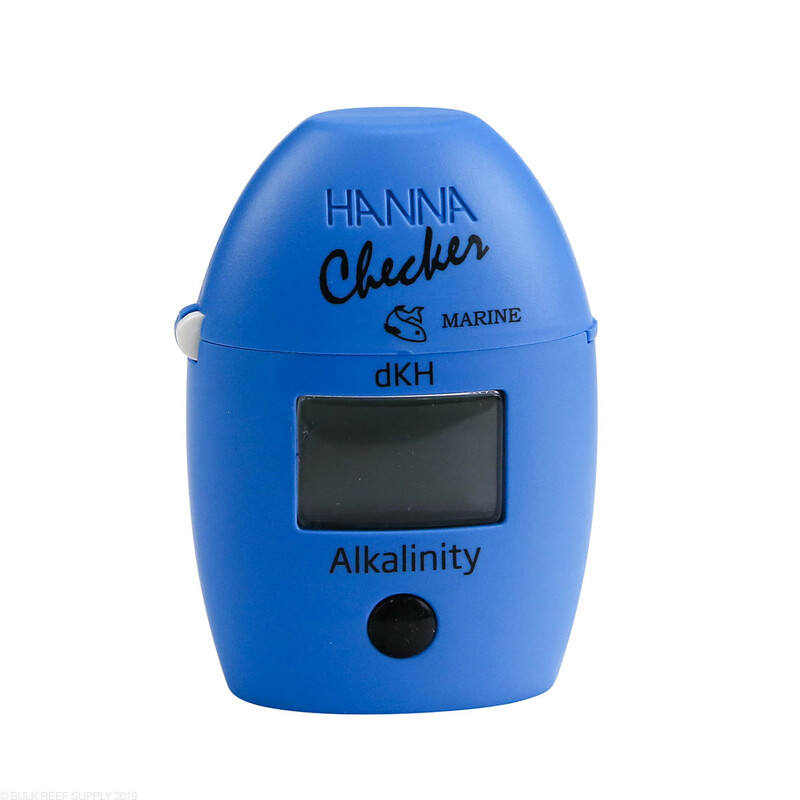 The dKH checker by Hanna is one if the easiest to use and just as accurate as all current hobby grade test kits for dKH currently available. Feel free to let us know if you have any further questions! Hanna list a calibration kit specifically for the HI772. Do you carry this or will the one for the HI775 work? You can use the kit from the 775, the 772 checker is pretty much identical, but gives a readout of dKh instead of PPM. How many tests will the included reagent perform. This checker includes 25 tests. If you have any other questions, let us know! Do you use the extra tip for the syringe just to fill the syringe with the reagent or do you fill the reagent to 1mill+extra tip full into the vial? thanks! The tip should be attached to the syringe prior to drawing the reagent fluid. You will want to draw the plunger to the 1mL mark, and the actual fluid will not actually be drawn into the syringe, but will just be drawn into the tip. This ensures more consistent dosing, and avoids fluid fouling the syringe portion. What the difference from this an the HI775? Thanks for reaching out to us! The HI755 gives you a reading in PPM, which can be converted into DKH. The HI722 gives you a result that is already converted into DKH. Please let us know if you have any other questions! While there are those that do not use the tip for drawing reagent, the manufacturer does specifically recommend using the tip for the best consistency and accuracy, and we recommend following their directions. Will they provide a new reagent for this new HI772 Alk Checker (dKH) or does the previous HI755-26 reagent work? This checker will use the same reagent as the HI755-26. Feel free to let us know if you have any further questions!